The HG 4000 E has a smaller nozzle than the HG 5000 E and delivers up to 600 l of hot air straight to where it's needed. 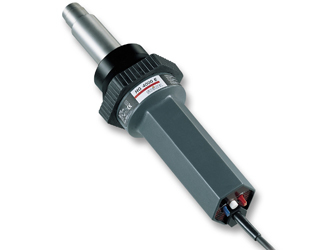 Fitted with the appropriate attachments (accessories), the HG 4000 E is ideal for larger areas such as welding plastics. To ease maintenance it has an easy to change heating element and the power cord can be changed without taking the enclosure apart. Airflow rate 600 l / min. max. Delivery nozzle 30 mm dia. Heater life approx. 500 – 800 hrs.